We really like lions. Our favorite one is probably the Food Lion, the grocery store where we used to buy deli meats back when we lived in North Carolina. On every tuesday they would have discounted rotisserie chickens, too. 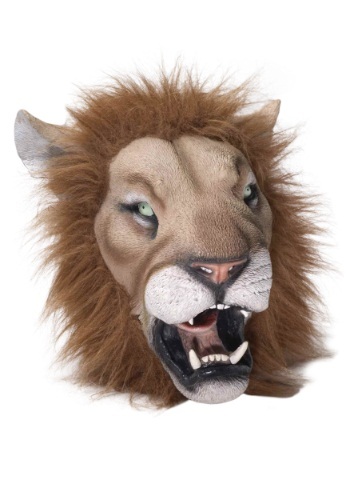 This lion mask may not have a frozen dessert aisle, but it’s still the mask of a high quality lion. It has a saucy mane around its neck, which we understands makes it a boy lion. That’s the king of the jungle, right there. Just like Food Lion was the king of grocery stores when it had its “buy two bags of chips, get a free two liter of soda” promotion! Our Deluxe Latex Lion Mask has a breathing hole, which is a great feature for a giant rubber mask that you’re meant to wear over your head. Wear this for a school play, for everyday fun around the house, or just to bother the heck out of your dog!